Pro Tools HDX, the dedicated DSP platform for today’s Pro Tools Ultimate software was first announced back in October 2011. I ordered my system within days of this announcement, well before any UK distributors had any stock. I was keen to get an HD system in my studio, I was prepared to pay the full list price of £8,000 at the time, upfront and wait until stock became available. Mike Thornton, our Pro Tools Expert Editor, and I have a running joke as Mike believes he purchased the first UK HDX rig, I then must own HDX serial number UK002! Jokes aside, I chose to go the HDX route because my studio business back in 2011 was busy pretty much 12 hours a day, seven days a week working with clients and bands. My then Pro Tools LE system was frequently hitting the limits of track & plug-in count which caused all sorts of embarrassing moments in demanding and often pressured paid jobs. HDX looked as though it would solve a lot of these issues in one go - Track count was higher & guaranteed and plug-in processing could be moved from native (host computer) to the HDX DSP. The price of entry into HDX was high but I was more than happy to make that investment as I felt my workflow had outgrown the then entry level (limited edition level) of Pro Tools. I took delivery of my HDX system in late January 2012 after at least a two month wait. It was clear within the first week of using the HDX rig that the right choice had been made. Sure, there were a couple of bugs in Pro Tools 10 but the system as a whole was really sharp, very responsive (thanks to disk cache) and powerful… even under heavy plug-in load. Scroll on seven years… My HDX rig has seen countless versions of the Pro Tools application come and go and it still very much features at the heart of my studio workflow. Very recently a musician friend asked me if I had ever used my HDX to the max, by recording and mixing at the HDX sample rate limits of 192 KHz. My response was that I had not and I couldn’t give them a reason to why I hadn’t at least tested this at some point in the past. This question sparked an idea that I thought would make an interesting Pro Tools Expert test so I plucked a song from my wife’s songwriting catalog and set a weekend aside to record and mix a song in Pro Tools HDX Ultimate at 192 KHz. Before we get into this I want to make it clear that for years I have typically recorded and mixed at 44.1KHz for music projects. My reasoning has always been why work at a higher sample rate if the end result is only going to be delivered at 44.1 KHz? That’s been my philosophy, you are more than welcome to agree or disagree with that in the comments below, although I’ve got a feeling that mind set has just changed… read on to find out why. Before I started production I had no idea how the system would fair, if my 2 x 3.46 GHz 6-Core Intel Xeon (12-core) 2009 Mac Pro (64 GB RAM) studio computer would struggle or not to cope or if some of the limitations that inevitably come into play at working at 192KHz would scupper my production mid song. When I was describing my HDX rig to my friend I thought up a decent enough analogy that I feel will illustrate this HDX test. Think of the HDX card, which is in essence a powerful sound card, as a supercar. Most people who own a Ferrari never take their expensive car to its top speed of over 200mph. My HDX system has been treated no different, keeping well within the speed limits over the last seven years of owning it - It’s now time to take my HDX rig for a spin around the race track to find out what it’s “top speed” is like. Not only did I want to set out to record and mix an entire song at 192 KHz, I also thought it would be fun to record only acoustic instruments, which meant putting my virtual libraries to one side. After all, I do have some nice instruments in my studio, why not just use these? I also wanted to test the Townsend Sphere L22 mic to the max. I’ve had one lying around the studio for a few months and I’ve absolutely fallen in love with it, though I do sometimes struggle to hear the subtle differences between some of the modelled mic models and wondered if this could be down to the 44.1KHz sample rate I typically work at. Maybe working in “higher definition” would enable me to hear and appreciate each of the mic models more? Setting up a Pro Tools session at 192 KHz is as simple as selecting it in the Dashboard, though if you want to work at this you will need an audio interface that supports 192 KHz. Working with high sample rates means the Pro Tools session folder will demand more storage space on the drives, much MUCH higher than you would ever imagine you would need if you typically work at 44.1 KHz or 48 KHz. I made sure to locate the pending session on one of my drives that had plenty of room to avoid the possibility of error messages popping up mid production. After those two steps were completed a relay in my HD I/O made a clicking sound, the little green indicator light next to the 192 KHz label on the front panel lit up and I was ready to get to work. Of course I could lean up this session by committing the Townsend plug-in inserts to the track which would free up one voice per channel… but I chose not to do this as I wanted to keep my options open in terms of mic choice and polar pattern as the production developed. After these main tracks were down I thought I’d check on how big the session folder had grown to. There were roughly 3 to 4 takes per instrument, no more than usual for me in my workflow, so the clip list was well populated with audio that were not in my main timeline. I was quite shocked to see that this one song, with a modest track count had grown so quickly to 16GB. To put that into context, a similar session at 44.1 KHz with an audio folder with a similar number of takes would be in the region of about 2GB to 4GB. I know storage isn’t really an issue these days as we can buy huge drives for pennies but it’s worth keeping an eye on these 192 KHz folders as they grow in size quicker than newborn babies. 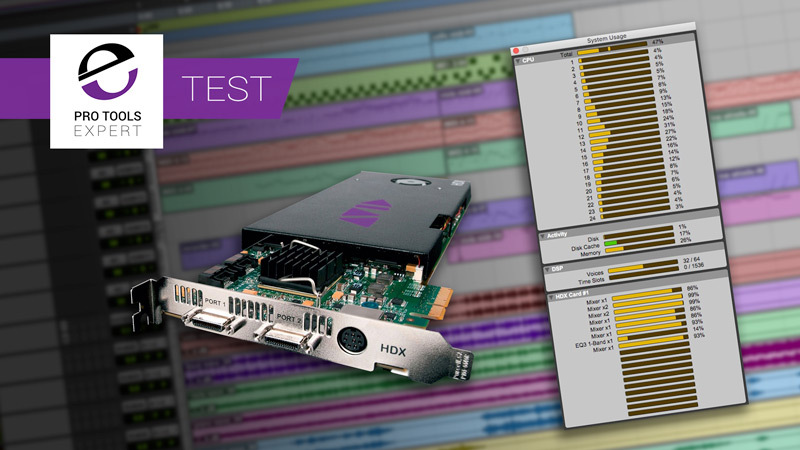 Read: Pro Tools HD Native And HDX Hardware - Do We Still Need Them? I digress… now that the majority of the song was tracked I turned my attention to mixing. Mix with a blend of both native AAX plug-ins and DSP. There are of course big benefits to be had mixing with only AAX DSP as these plug-ins are processed only on the card which frees up the native processors. The problem though was out of the hundreds of plug-ins I have on my system, from many and varied third party developers, I only have the Pro Tools stock plug-ins, a couple from Plugin Alliance and roughly 25 plug-in from Softube available in AAX DSP. While these are all fantastic plug-ins, that of a few I do use regularly, there are other “go tos” I use that are only AAX native. On a side note, AAX DSP was never widely adopted by third party developers which has always felt like a bit of a shame. In reality HDX never really lived up to the expectations of those who once used or owned the previous Pro Tools HD system. If you want to know which plug-ins are available in AAX DSP format then do check out our AAX Plug-in Searchable Database. Back to mixing, I chose not to limit my options by using only DSP plug-ins. I reached for the plug-ins I know best regardless of DSP but there’s a catch to this workflow that can be quite the problem if you don’t insert plug-ins carefully. If you load an AAX DSP plug-in on a mono track in insert A followed by a native plug-in on insert B you will use up one voice on the DSP, double that if you are working on a stereo track. These voices don’t show as “used” in the System Usage > DSP > Voices window as that displays how many voices have been used for channels. The voices that are used for DSP plug-ins running into native plug-ins are invisible and you won’t know if you’ve used up all the hidden voices until you start to see your voice count drop in the system usage display, and if you’ve only got 64 voices available for tracking/playback as I did at 192 KHz, you can very quickly eat through the power of an HDX rig. I was surprised to find that a number of my native plug-in didn’t show up in my plug-in dropdown menu, many of which were Waves plug-ins but that didn’t stop me in any way from getting the mix moving along. After some investigation I discovered that not all Waves plug-ins support sample rates higher than 96 KHz. You can find out which Waves plug-ins support 192 KHz on Waves Sample Rate Support page. How Does It Sound Recording & Mixing At 192 KHz? As I stated at the start of this article I have, for many years, typically produced music in Pro Tools at 44.1 KHz. The differences between this everyday sample rate and 192kHZ are profound. Let’s ignore some of the computer and system limitations of working at this higher and high def audio sample rate and focus on just the sound… after all that’s the most important part of this test? The Townsend Labs Sphere L22 microphone was my main microphone for tracking. I been using it for several months with great success but I have found it a bit of challenge to really feel as though I can discerningly hear the differences between mic model characters at 44.1 KHz, not the case at 192 KHz. The differences are night-and-day different, it’s like a whole different level of detail unlocked in an instant, much like getting a new mic altogether and all I had to do was change my sample rate at the session startup page! Before I get torn apart in the comments telling me that these kind of audible results can also be achieved at sample rates around 88.2 KHz or 96 KHz I just want to remind you that the main purpose of this test was about discovering the limits of my HDX system. I paid top dollar for a rig that provides this 192 KHz workflow that I’ve never explored before. This test was well worth doing as the big surprise came in the forms of the Townsend Lab mic sounding as good as it did at 192 KHz. I will follow up this test at some point with a 96 KHz test with the Townsend to find out if I can get the same level of detail to touch my ears… but that’s for another day. There’s a depth to the overall sound that I haven’t heard in lower sample rate sessions. Plug-ins such as Melodyne are way more forgiving. Reverbs sounded cleaner and more 3D-like, making them so much easier to place. EQ and compression sounded noticeably more detailed. 192 KHz made the difference between the Townsend Sphere mic models night-and-day different whereas these differences in character, to me at least at 44.1 KHz & 48 KHz where slight and difficult to appreciate. Overall there is a quality to the sound that I have not experienced before which I believed helped me get the mix done quickly and more creatively than usual. Of course this is not a blind test so one has to allow for the possibility of a certain amount of placebo effect when judging the sound. Not so much of an issue these days with inexpensive storage solutions but session folders will grow in size similar to video production session folders. This could cause problems if you wish to share you sessions with collaborators online. Mixing with AAX DSP plug-ins and AAX native plug-ins in the same chain uses voices. While this is to be expected not knowing how many voices are left available can catch you out by surprise. I found I was watching the System Usage window in Pro Tools like traffic wardens watch parked cars... thankfully I didn’t get a ticket! As always, we would love to hear your thoughts and experiences on this topic in the comments below. Does your audio interface support 192 KHz? Have you ever recorded and mixed a song at a sample rate of 192 KHz? Would You Be Interested In A 7 Day Pro Tools HD Software Rental? Are Avid Leaving The Interface Market?